Erin Blegen: My Scrap Cabin: C'est Magnifique Kit Reveal #3! C'est Magnifique Kit Reveal #3! C'est Magnifique Full Kit Reveal!! 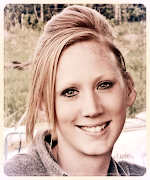 My new blog debuts its first layout!! Welcome to My Housewarming Party!! GIVEAWAYS!!! 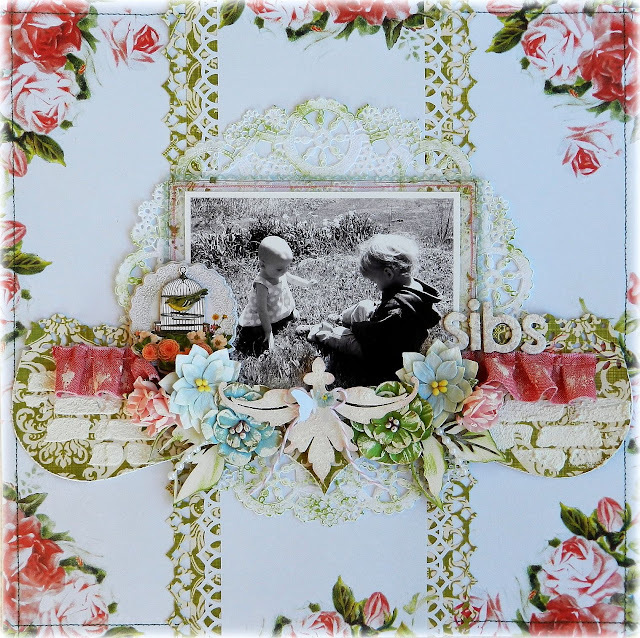 As promised, I'm back today to share with you my last two projects using the beautiful July kit from C'est Magnifique! It is truly a rare thing for me to get a picture of my rowdiest child, Gunner, with his little sister. But when out visiting my mom a little while back, he decided to sit down with her in the grass. I managed to get only two shots before he got back up to go running about again, and if I hadn't had my camera on and ready, I would have missed this moment . The July kit is nothing short of beautiful. It's perfect for delicate moments like this one; the beautiful reds and pinks, supported by rich green shades and just a hint of blue. Everything seems to just fall into place in harmony. And I love that even though I stuck to a fairly clean design, the rich patterns of the papers give my layout that more "full" look which I normally prefer. Prima Chalk Fluid Edger Pad "Old Rose"
Oh How beautiful.. and what a great photo to capture too!! 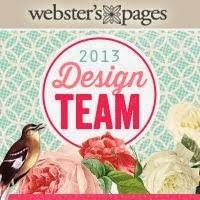 Those papers look lovely, and you have worked your magic and created a gorgeous layout, and the card is fabulous too!! love both of these!! WOW!That layout is nothing short of magnificent.... Such a GORGEOUS design Erin!! Also! that Card is FAN FAB U LAS!! Great LO & card!Love all the borders on your LO. Totally beautiful Erin!! Just loving everything you create right now! Love the lines you created on this one Erin and how they bring your eye right to the photo! I have that problem too, because Reese doesn't sit still for more than 2 seconds at a time!! 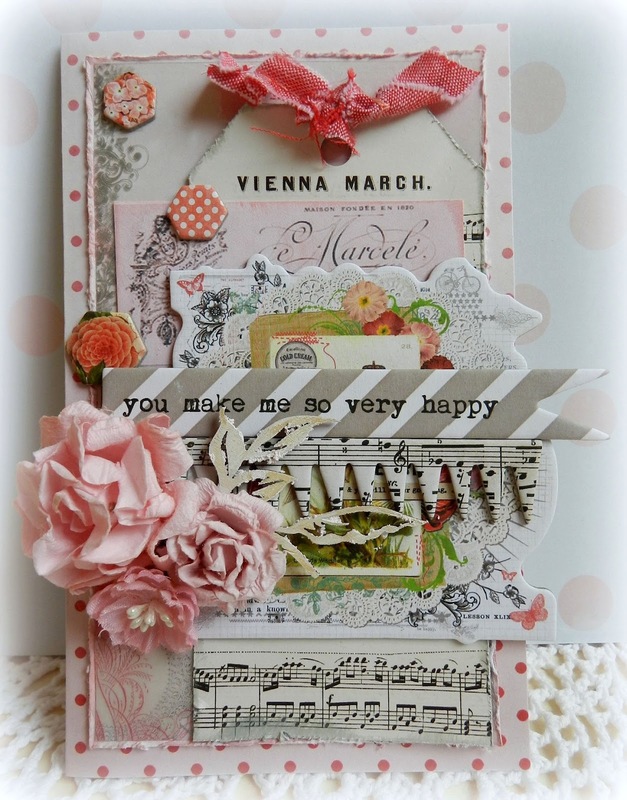 And the card is really pretty...love the chipboard banner piece with the music notes on it! So lovely Erin. What a gorgeous kit to work with, you've showed it off beautifully. these are just soooo beautiful!! love all the details! Stunning! I love the card. So very pretty. beautiful layout! I love all the ruffles and the doily! Your card is awesome too! I totally love what you created here! and the photo is so sweet and special! Amazing how boys cannot sit still hey? Even at 8 and 10....lol. Gorgeous page and you have used the paper beautifully by making it all symmetrical. Fabulous work.